In Cambridge during the late Nineties or very early Noughties I remember a curious sense of familiarity meeting Pete. I reasoned that during my early years in Cambridge, before most of my adult life in London, we must have crossed paths somewhere at a party or a pub. Perhaps we’d just seen each other marching to and fro along Mill Road. But when did I first hear Pete’s music? I remember spending time with him filling biodegradable packets of muesli at the Arjuna health foods warehouse where we both worked for a time. One day, after Pete had introduced me to Vicki Bennett’s’, ‘People Like Us’, I went home and found his music online. As a poet he’s a lyricist scraping nails across the blackboard, hammering his ambiguous oratory upon the asylum’s panopticon and alerting the lunatics within. Much has been written about Pete Um online and in print, offering the surreal, informed and sometimes mellifluous treatises of analysis that he deserves. He has been a staple of the Cambridge underground for many years and if I were tentatively to offer some musical comparisons, I might mention Ivor Cutler, The Residents, Beck, Captain Beefheart, Harco Pront, Lone Pigeon and Gary Wilson. His performances are unpretentiously eccentric and even brave; there is an ad hoc video of Pete performing ‘Holy Fire’ using a beat box upon Midsummer Common at the end of Cambridge’s annual Strawberry Fair in 2004 - a performance wherein, like Antonin Artaud’s Theatre of Cruelty, the safe distance between himself and the audience almost collapses into brutality. The video for ‘Grow To Her’, from 2012’s, Babysitting The Apocalypse, stands in my humble opinion as one of the most moving declarations of love. As a sound artist, his use of instrumentation is a technique of disquieting polyrhythm, carved from an assembly of subtractive synthesis, ripped from comfort and expectant staccato into an orchestra pit of seizures. Artfully mastered, Contempt, has at its core a chaos that generates a glorious order. The form has a smooth analogue curve, seemingly uninterrupted by the minutiae of crude digital stepping; Voltage Controlled Oscillators like wet skin slip on enamel. The human voice lilts as if singing nursery rhyme, shanty, bar song or mantra. Sometimes you’re whispered to; an intimate share in significant furies and cheeky pop tropes, - ‘Yeah man, alright!’ he swaggers satirically on ‘Zen And The Teapot.’ Beat box drum, garage pump, playful and endlessly creative like a child left alone with cutlery, Contempt’s clattering sonar is an elegant present for the trained ear, the lover of indeterminate sync. Like a wicker man shanty before the pyre, a lament, a shivering prophesy: ‘It’s like life is the biggest of bummers / when you’re caught with both feet in the past / I can see just where I came from / but I don’t have a clue where I’m going / Its the same song sung through the ages / death needs time for what it kills to grow in / death needs time for what it kills to grow in / death needs time for what it kills to grow in.’ – ‘Death Needs Time’. The tracks are short, economical and absolute, careful and koanic doses without the drip fat of the languorous; a crisp defence against excess. In ‘The Rebel’, the final track on the album, Pete nods to the film of the same title starring Tony Hancock, an anti-establishment gig about a downtrodden office clerk. Hancock’s daubing, naif autodidact becomes a fraud by accident in Paris when a friend’s artwork, considered better than his, is confused with his own. Taking his leave of the art world Hancock says, ‘I know what I was cut out to do and I should have done it long ago. YOU'RE ALL RAVING MAD!! None of you know what you're looking at. You wait 'til I'm dead, you'll see I was right!’ Is this Pete’s morbid and self-deprecating vision of an epitaph? In 2002, The London School of Pataphysics, recreated Hancock’s fictional works and displayed them in a show called, ‘Anthony Hancock Paintings and Sculptures.’ Pataphysics, as Alfred Jarry explained it, is ‘the science of imaginary solutions, which symbolically attributes the properties of objects, described by their virtuality to their lineaments...’ Unable to escape the tautological bindings of the Spectacle, in that ‘The true is a moment of the false,’ Guy Debord's description of a 'victorious and spectacular real as unreal, where nothing IS, until it appears within the Spectacle itself, even if in that moment of its appearance it would lose what ever reality it held,' goes some way towards describing the sonic situation Pete identifies and opposes. In paraphrase of Jarry’s post-metaphysical phenomena, Jean Baudrillard wrote that ‘Pataphysics is a science, albeit one with an aesthetic sensibility; it regards "humour" and "the serious" with the same imperturbable gaze.' This strategy, I believe, though devised in an attempt to resist omnipotent commodification in the realm of images, is at the heart of Pete’s musical world; a resounding critique of the contemporary sonic Moebius Strip - charged with poignant contempt. ‘Me and you, we do what we do / don’t be a moral slob / We make our lives / with forks and knives / we eat reality raw / Do it yourself / Everybody needs themself.’ - ‘Them Self’. And there is the spirit of Jarry’s Ubu Roi in Pete’s work, the precursor to the Theatre of The Absurd and Surrealism, the antithesis to the Spectacle with which Pete satirises the complacent Bourgeoisie and the abuses of authority flaunted to engender success. Such piercing critique is an illustrious flame passed from hand to hand by those wise enough to carry it, and assuredly Contempt brandishes that visionary torch. 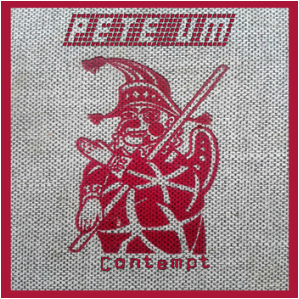 Pete Ums, Contempt, is available now in digital and limited edition vinyl from Bandcamp. If you’re in Cambridge, you can buy the round plastic version with a hole from Relevant Records. One can suggest that this spectacle of 'self', is like a dream state of unattainable desire, morphing our habitually-mediated image into a torpor of endless consumption, becoming a surreptitious surrogate for disrupted identity. Micallef's impasto offensive rises from the ocular luminescence of mineral and liquid prima materia like a swirling nemesis, conjuring anxiety before the insidiously questionable motivations that have led us to a position of faithless angst and demanding a proportional erasure of all that it challenges. His paintings are a call to arms. The questions that are provoked by their power are spiritual, philosophical and psychological. Who are we? What have we become? Where are we going? During the nineteenth century, famously, both Soren Kierkegaard and Friedrich Nietzsche engaged with the paradoxes proposed by a changing culture from one of unquestionable faith to a secularism that has led, rationally, to an end of such faith. Scientific positivism has liberated us from superstition in the West, but has led to a disconnection from our environment and our place within it. The cosmic and cultural landscape we inhabit has changed from an organic relationship to one that posits us within a paradigm of virtuality, a domain where the 'self' is in constant flux, where identity, from a premise of anonymity, morphs as regularly as breath. But like painting we too are in constant metamorphosis keeping up with a desire for acceptance. Each new mark leads to an uncertainty that is unanimous with a long held belief that nature is somehow beyond representation, a primal complexity for image making from Ovid's Narcissus to the contemporary 'Selfie'. Micallef's alchemy, in a furious reflection of a frustrated commodification of selfhood, fascinates with the industry of hard won contemplation. What distractions of mind did he fend off as he battled alone? These paintings further establish an already-seasoned artist as a mature, confident painter and demand answers. Who are we? What have we become? Where are we going? Antony Micalef’s ‘Self’, continues at Lazarides, Rathbone Place, London, W1, until the 19th of March.